Seeing a cosmetic dentist in Manahawkin is about more than just your looks. Cosmetic dentists are trained to spot oral health conditions before they become serious problems. They can also help you to enjoy renewed self-confidence, a key factor in enjoying a happy social and professional life. A more youthful appearance. Studies show that people who look cheerful also look younger. The opposite is also true. Those with a downcast expression appear older to onlookers. A thinner appearance as well. Believe it or not, a smile not only can make you look you look happier, it can actually appear to take inches off your waist line. Of course, smiling by itself is no substitute for exercise and a proper diet. Still, anything that inspires you to take good care of yourself is worth considering. A better mood. Smiling can improve your state of mind, even if you’re not feeling particularly happy at the time. It seems that your brain takes a cue from your body when it comes to emotions. A happier relationship. This applies not only to interpersonal relationships but to family, work, and school-related ones as well. Those who smile are more likely to make friends and create a positive impression on others. A longer life. Research indicates that people who smile for portraits can add as much as seven years to their lifespan. 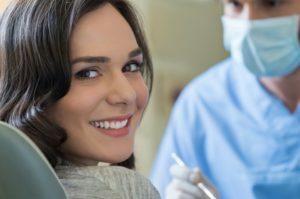 If increased popularity, a better mood, and a longer life sound interesting, then read on and see what cosmetic dentistry has to offer you. As with any dentist in Manahawkin, a visit to a cosmetic specialist begins with a complete oral exam. This is an important precautionary step designed to catch potential problems in their earliest stages of development. Teeth whitening. Sometimes the only thing your teeth need is a little touchup. Professional whitening removes stains and discolorations that are beyond the reach of regular brushing. The result is a brighter, more beautiful smile for a minimum investment of time. Dental veneers. Sometimes even healthy teeth don’t look their best. This can stem from a variety of issues, including thinning enamel, lifestyle factors, or the effects of heredity. Veneers hide stains, cracks, and other imperfections, acting almost like a facelift for your smile. The results can be dramatic. Tooth restoration. From dentures to dental implants, your cosmetic dentist can recommend treatment options that will enhance not only the functional but also the aesthetic dimensions of your oral health. Make an appointment to see your local cosmetic dentist about your smile enhancement options. After all, you’re too important to go through life with a frown on your face. Dr. Robert Young is a skilled cosmetic dentist with advanced training in veneers, implants, and other forms of restorative treatment. Dr. Young is a graduate of the New Jersey College of medicine and dentistry, completing his course of study near the top of his class. You can reach his office online or by calling (609) 597-1830.